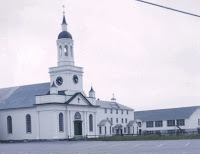 As a youngster in Stephenville,NL, I would get up early in the morning before my parents and go to Grandma's house for breakfast. Grandma's name was Angela Bennett. She did not serve me spicy food because it was mostly fresh and unprocessed. Spices were not needed. A meal usually included fresh baked bread and real butter. Grandma's friend in Port-au-Port churned the butter and provided plenty of it. Grandma was the matriarch of a big family .. six sons and six daughters. Aunt Theresa and Aunt Veronica (Dolly) lived nearby so I could visit them for more treats. Other aunts and uncles lived in the town. A couple of aunts married American airmen from Harmon Air Force Base and moved to the states. I remember old albums with sepia-toned photos of the aunts and uncles all together. I suppose these albums have been lost in various fires. I am not sure if grandfather's name was Charles Bennett since everyone just called him Pop. His name probably evolved from Benoit (sounds like ben-wah) of the Acadians. Pop was the strong, silent type whose job was to bring home the bacon for a big family. He had a big belly like Santa Claus or a Fat Buddha. Sometimes I would find Grandma scolding Pop in French. Pop was not bothered by this, he just calmly smoked his pipe and waited for the sunshine again. One morning I got the scare of my young life. When I opened Grandma's door, there was a huge moose head with big rack on the floor. I bolted. I had never seen a picture of moose so this thing was alien to me. In the winter, Pop mended his gill nets. In the summer, he lived in a shack on the seashore with his pals. One of my tasks was to go down to the seashore and get a fish for dinner from Pop. Pop had a dory which he would row out to the gill net and bring in the fish. But I never saw him do this. He would be smoking his pipe and relaxing whenI arrived. I would always bring home a fresh cod or salmon. In June, small fish called smelts would roll in with the evening tide to spawn. I could catch these smelts in my hands, they were not slippery. Cod would chase the smelts so there much activity on the water. One evening, I went cod jigging with my father. Jigging is done with a heavy hook where you play out the line until it hits bottom and then jig it up and down. It was a pleasant experience with the dory rolling up and down in the swell so the beach would appear and disappear. I jigged a large cod which I could hardly pull up from the deep. It was delicious and we knew where our food came from. 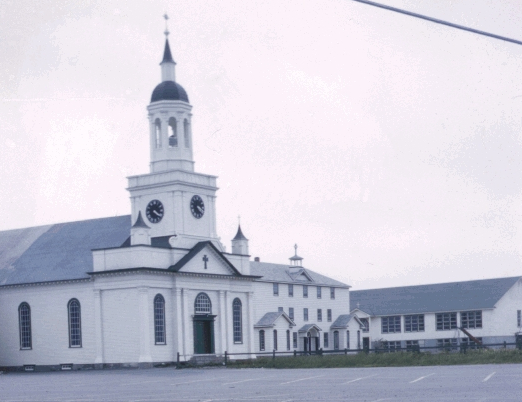 Stephenville began as village of a few hundred people who farmed and fished for a living. The Bennetts owned a large tract of the future town. Everything changed with the construction of Harmon Air Force Base. Many sections of the Bennett's land were sold to accommodate a big population increase. Shops, restaurants, and taverns were quickly constructed. They tended to catch fire and burn to the ground. 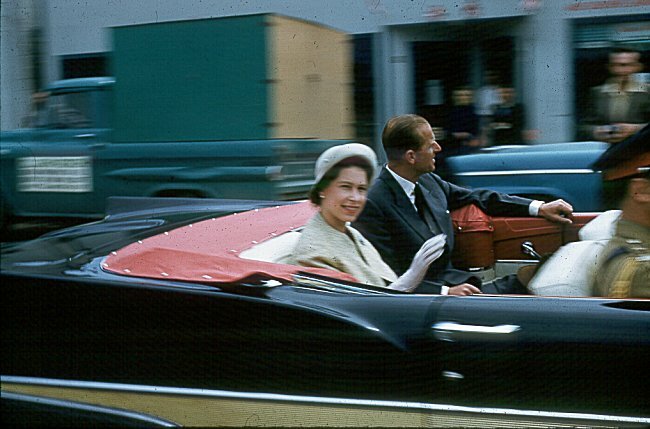 Queen Elizabeth and Prince Phillip dropped by in 1959. A large crowd from around the bay came to see them. Newfoundland was a British Colony until 1949. Now it is Canada's tenth province. Here is photo of Main Street. First there is Eatons. One could drop off a catalog order form and pickup the items a few weeks later. Then there is the Red Rose Club for booze and music. And in the background is Uncle Mike's apartments. His family lived upstairs over the Chinese restaurant downstairs. We lived on Bennett's Lane which was near Queen and Main in the center of town. There were two taverns and a nightclub near the center. Summer evenings many people would come from Harmon to stroll the street and take in whatever entertainment they could find. According to the linked documents, it was mostly quite sociable.